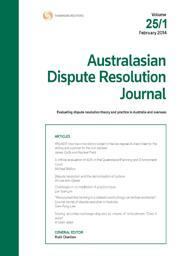 The Australasian Dispute Resolution Journal, published by Thomson Reuters (then Law Book Co), was a pioneer in venturing into the field of publishing academic articles relating to mediation. This came about through the efforts of the late Micheline Dewdney and Ruth Charlton, supported by ADRA and encouraged by the late Sir Laurence Street. Sir Laurence contributed the first article for publication in February 1990 and remained till his death the Chief Editorial Consultant of the Journal. That article, still fresh and relevant today, was republished in Part 2 of Volume 28 as a tribute to his vast contribution to ADR. Innovation and research continues to expand our knowledge in the broad field of dispute resolution. Thus the Journal would welcome the receipt of unpublished topical articles (up to 5,000 words) and book reviews (up to 1000 words). All articles are peer reviewed. Contributions should be emailed to the Thomson Reuters Editor at lta.adrj@thomsonreuters.com.